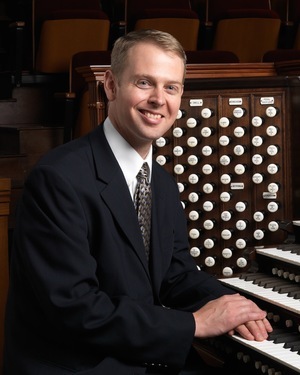 Andrew Unsworth has been a Tabernacle organist since 2007. He performs in recitals regularly on Temple Square and accompanies the Tabernacle Choir at Temple Square in all of their concerts, rehearsals, tours, and broadcasts. He is often featured as an organ soloist in the weekly Music and the Spoken Word broadcast. He was selected upon the retirement of John Longhurst. Unsworth was born in 1970 and raised in Potsdam, New York. He grew up listening to and playing along with organ records. He wasn’t tall enough to reach the pedals until he was age 14, so he concentrated on playing the piano until he could switch. He earned his bachelor’s degree in keyboard performance and pedagogy from Brigham Young University. He then earned both his master’s and PhD degrees in music history from Duke University. He yearned to one day be a Tabernacle organist, but with only three full-time organists, he figured he shouldn’t base his career on his dream. He served as music director at St. Paul’s Lutheran Church in Durham, North Carolina, and when he learned an organ performance position opened at the Cathedral of the Madeleine in Salt Lake City, he applied and was selected for the job. There he learned how to accompany choirs and play for large services. He also served as assistant director of music. He was there for five years until 2006. He also briefly taught at Stephen F. Austin State University in Texas as an assistant professor of music history and organ. Unsworth is a member of the American Guild of Organists. In 2010, he took exams with the guild and received the Associateship certificate and the S. Lewis Elmer Award (denoting the highest score of the test takers). Unsworth is a member of The Church of Jesus Christ of Latter-day Saints. He and his wife, Alison, are the parents of five children. This page was last edited on 13 October 2018, at 17:30.